Outer Banks pier fishing is a tradition on the North Carolina coast. 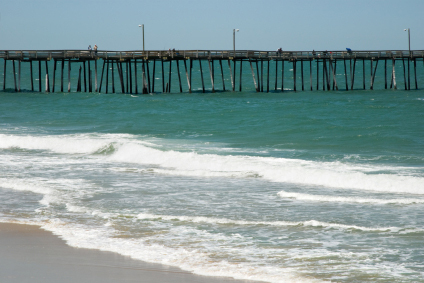 With numerous Outer Banks piers to choose from, anglers are sure to find a lucky spot to cast their lines. Vacationers fishing from Outer Banks piers will generally find good catches of small to medium sized fish such as blues, croaker, flounder, and spot. However, larger species such as jumbo blue fish, channel bass, and king mackerel sometimes come inshore to give anglers a thrill. Outer Banks pier fishing is usually best during the early morning hours and right before sunset, but sometimes there's just no rhyme or reason to when or why the fish are (or aren't) biting. Outer Banks pier fishermen (and "fisherwomen") love reeling in dinner, but they also love the camaraderie. There's nothing better than swapping fish tales and having some laughs with the folks on the pier. We also recommend introducing kids and teens to Outer Banks pier fishing - it's a hobby that can span generations and create long-lasting memories. In a world dominated by reality shows, video games, and text messages, Outer Banks fishing is a classic way to spend quality time with kids and grandkids. A gentle underhand cast is all that's required in terms of skill, so novices and youngsters are able to "catch on" quickly and enjoy the experience. Outer Banks piers are generally staffed with helpful professionals who are happy to answer questions and offer advice. Most OBX piers offer equipment rentals, as well as sell a variety of bait including mullet, squid, blood worms, and artificial lures. Pier fishing passes are usually sold by the day or by the week for an extremely reasonable price. Most Outer Banks fishing piers offer a blanket North Carolina fishing license to paying customers. An interesting sidenote... Long-time Outer Banks vacationers will likely remember Jennette's Pier at Mile Post 16.5 in Nags Head. This Outer Banks landmark suffered extensive damage during Hurricane Isabel in 2003. Fortunately, the North Carolina Aquarium Society has plans to restore and enlarge Jennette's Pier as a modern facility focusing on education and conservation. The new pier is expected to enhance the Outer Banks economy and become an exciting tourist attraction. With miles and miles of pristine coastline to explore, anglers never need to feel crowded or bored while surf fishing on the Outer Banks. Offering some of the best surf fishing conditions on the planet, the OBX is a top destination for professional and recreational anglers. One of the great things about Outer Banks surf fishing is that everyone from kids to seasoned, "old salt" fishermen can take part. Throughout the summer months, even inexperienced anglers can usually manage to catch enough small fish from the surf for a meal. Outer Banks surf fishing hits its peak during the spring and fall months when water temperatures are cooler. 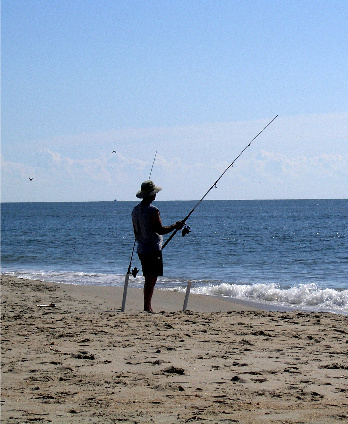 Surf fishing is a time-honored tradition on the Outer Banks. We encourage all vacationers to at least give it a try. Outer Banks bait and tackle shops are the best places to pick up the supplies you need and get some quick tips. Ever wonder what people mean by "Reading the Water"?Did you know that wind direction, tides, time of day, and water color play drastically in what you'll catch today, but just didn't know how it all comes together? The wonderful folks at Corolla Bait and Tackle can teach you and your family everything you need to know about surf fishing. Classes last approximately 2 hours and are usally held every Tuesday. Corolla Bait and Tackle surf fishing classes teach you the basic ABC's of how to catch fish on any given day on the Outer Banks. You'll learn reading water, locating fish, proper rig and bait presentation & selection, how to fillet your catch, and even how to cook it.